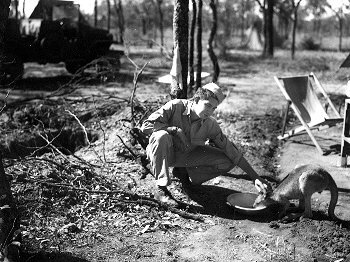 Street scene in Townsville taken in January 1943 at the time Jack Heyn and the 3rd Bomb Group were shipping out for Port Moresby in New Guinea. 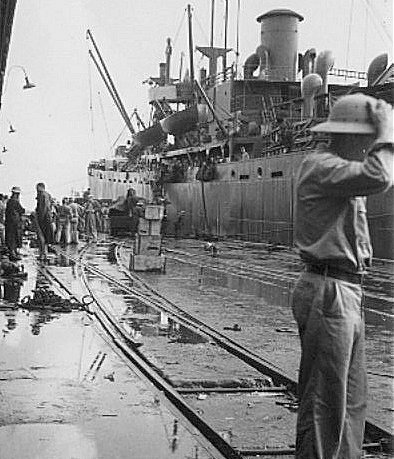 Townsville harbour in January 1943. 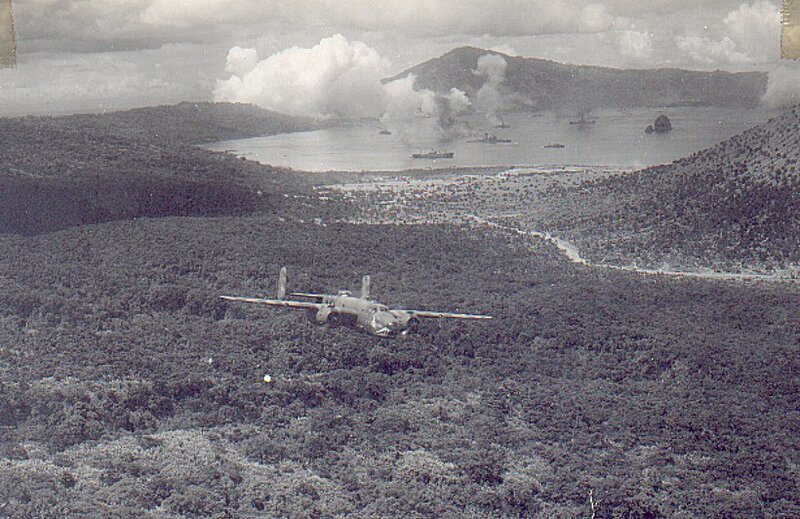 This ship transported the 3rd Bomb Group ground echelon to Port Moresy. 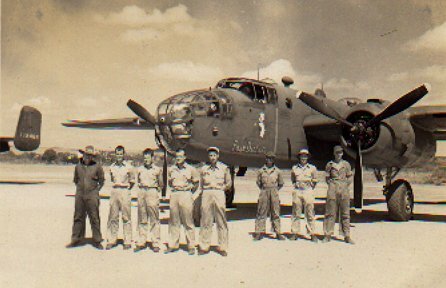 A combat crew in front of B-25 "El Aguila" (Spanish for Eagle) of the 13th Squadron of the 3rd Bomb Group in early 1942 at Charters Towers before the aircraft were converted to low-level attack planes. The tall fellow on the right end of the picture. is Col. James Hubert Davies. 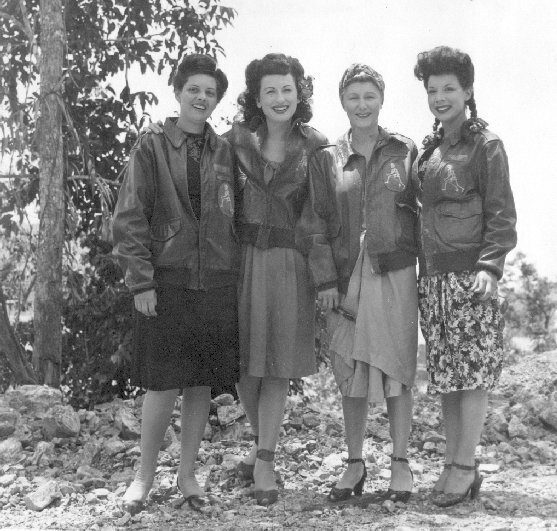 He was one of the pilots evacuated from the Phillipines to be assigned to the 3rd Bomb Group in March of '42. He became the Gp. 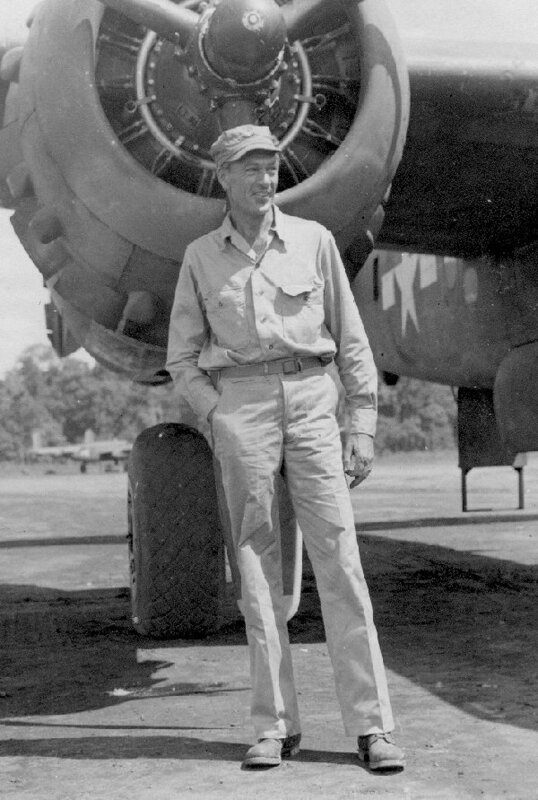 Commander, and on April ll, '42 led 10 of the B-25s and 39 crew member to Darwin. 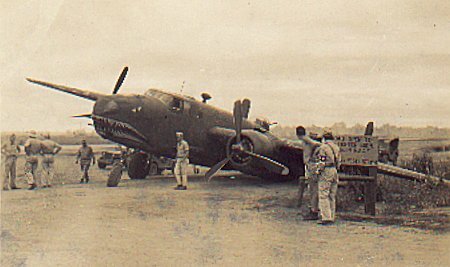 From there with the aid of auxilliary bomb-bay tanks flew non-stop to Del Monte on Mindanoa in the Phillipines. 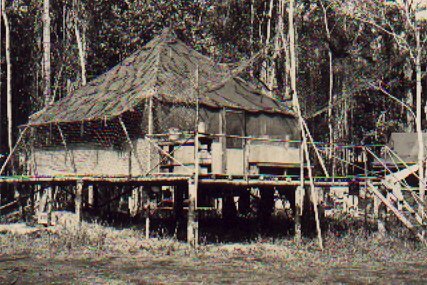 They operated out of obscure fields attacking shipping and installations in the Davao, Mindanoa area. 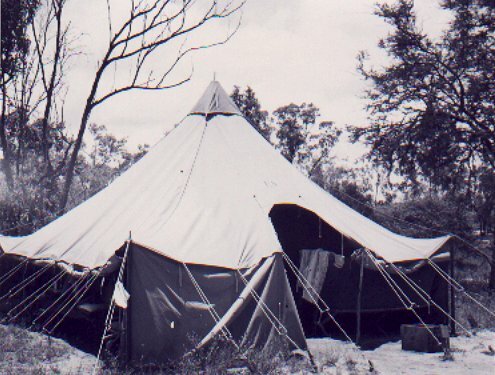 After 4 days the Japs discovered where they were coming from, and Col. "Big Jim" Davies led them back to Charters Towers via Darwin losing no planes or crew member. 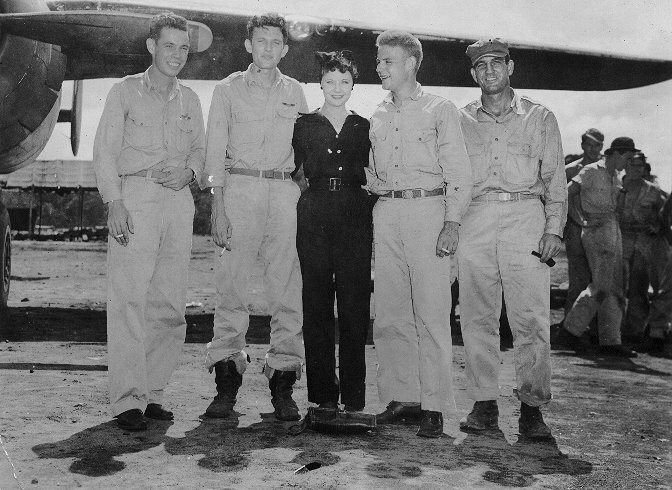 Since several of the pilots were evacuees from the Phillipines, who had lost their planes on the ground early on, it was sort of pay-back time for them. 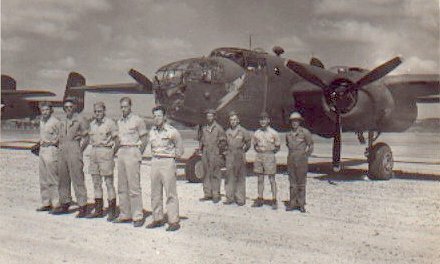 A combat crew in front of B-25 "Baby Blitz" of the 13th Squadron of the 3rd Bomb Group in early 1942 at Charters Towers before the aircraft were converted to low-level attack planes. 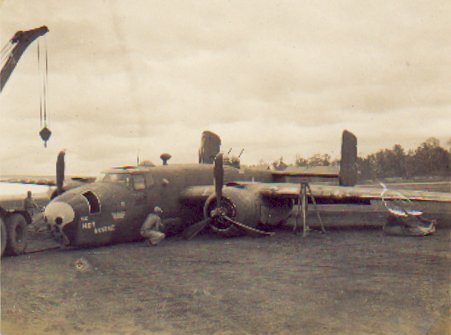 "Baby Blitz" was later burned up in a Japanese air raid on Port Moresby. 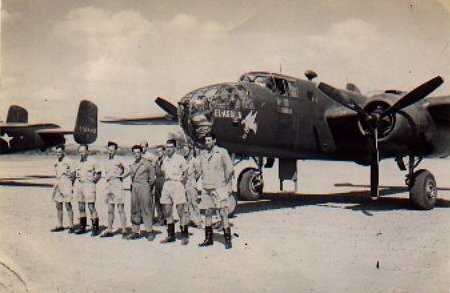 A combat crew in front of B-25 "Fair Dinkum" of the 13th Squadron of the 3rd Bomb Group. 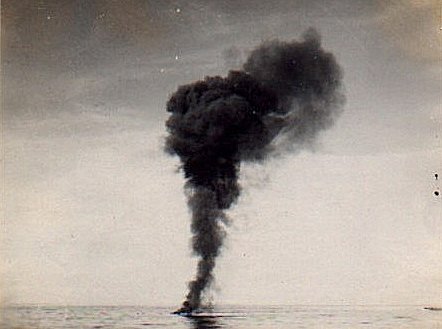 "Fair Dinkum was later burned up in the same Japanese air raid on Port Moresby as "Baby Blitz" above. 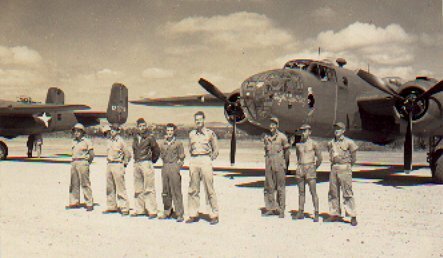 A combat crew in front of B-25 "Eight Ball Esquire" of the 13th Bomb Squadron of the 3rd Bomb Group at Charters Towers on 30 September 1942. 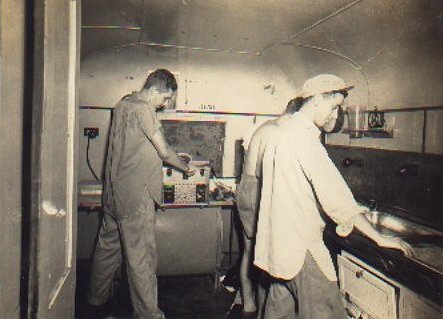 "Eight Ball Esquire later ditched in the Coral Sea, but the crew got back safely. 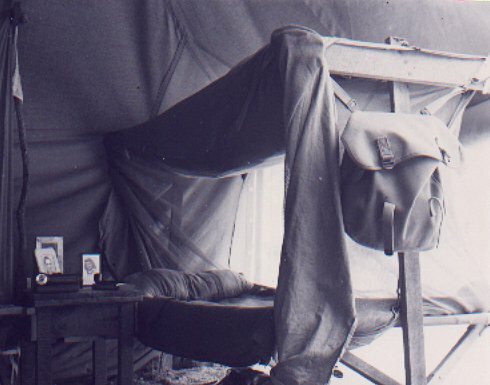 In fact one of the gunners was a tent mate of Jack Heyn. 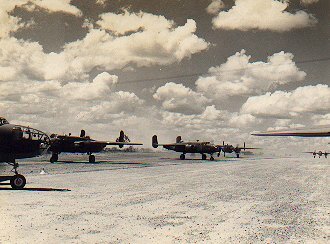 "Home away from Home" at Charters Towers for the 3rd Bomb Group. It was their first experience of overseas billeting in war time. 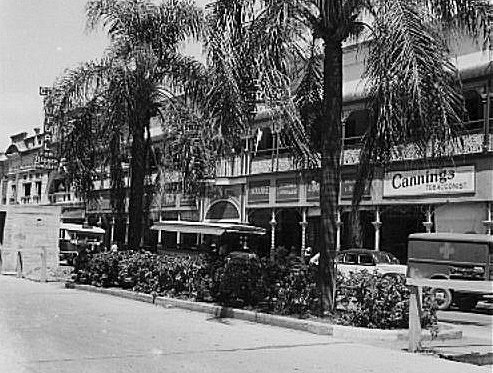 Was a bit primitive and served mostly as just a place to get their sack-time and very little else. As you will see later, things did improve. Yankee ingenuity, our living conditions did improve, even to the point of electric lights." 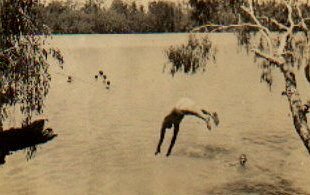 "Junggle plaza in the wilds of New Guinea"
Swimming in the Burdekin river. 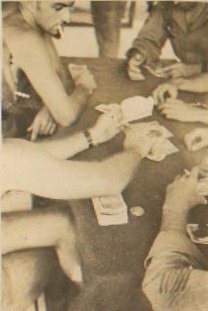 Poker game usually around pay day. Come pay day, many a poker game broke up to go to breakfast. 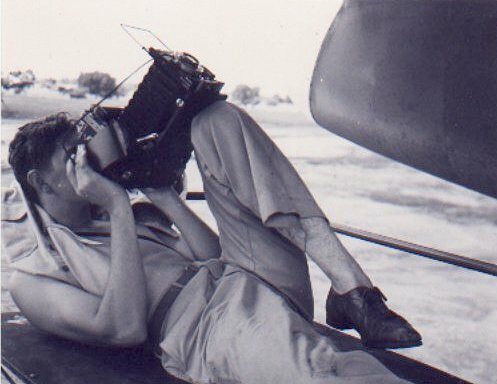 Jack Heyn photographing a defect in the tail of a plane for a U.R. report. Jack Heyn and the lab crew printing mission film for 5th Bomber Command. 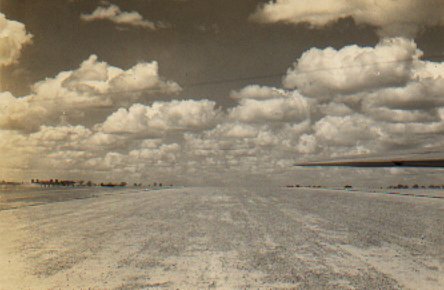 The cameras were all mounted in the tail of the plane and operated electronically. 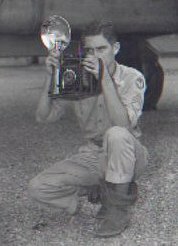 When they started the bomb run, the gunner would hit the switch and a 150 roll of film would roll through the camera taking a picture every 3 or 4 seconds. 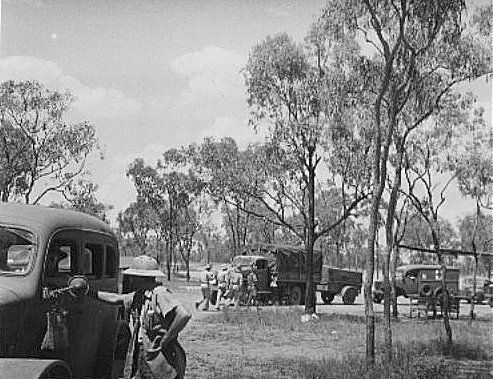 Part of the convoy that transported the ground echelon from Charters Towers to Townsville. They had stopped to take a break. 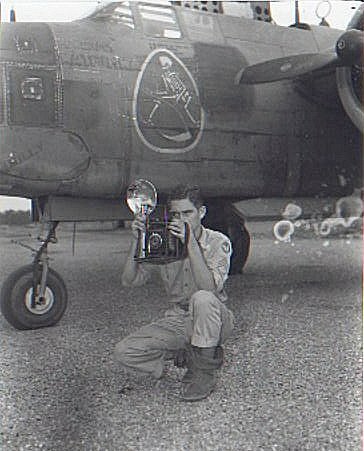 Jack Heyn had wrangled a job of driving one of the vehicles, so he would be along to get some photos. They thought they'd see if there was any gold left in that there river -- no such luck!! 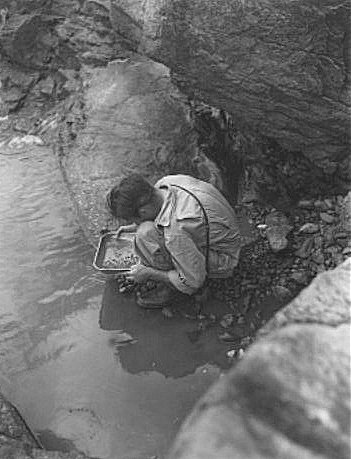 One of Jack Heyn's buddies, Melvin E. Owens, panning for gold in the Burdekin River. 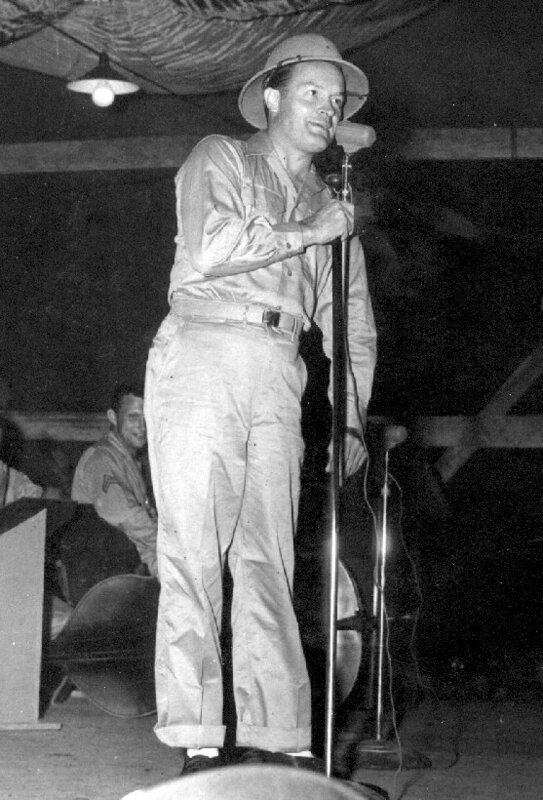 Melvin E. Owens was the bombardier on the B-25 Mitchell "Mortimer" in the 13th Bomb Squadron, 3rd Bomb Group. 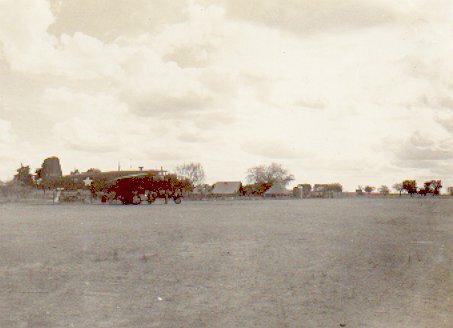 Charters Towers was once a large gold mining town. There were abandoned mine shafts near the town. 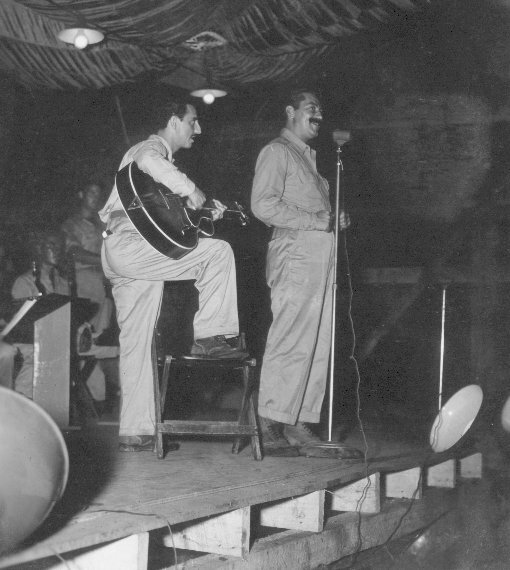 Jack Heyn said that they filled three of them up with garbage from their camp area while they were stationed there. 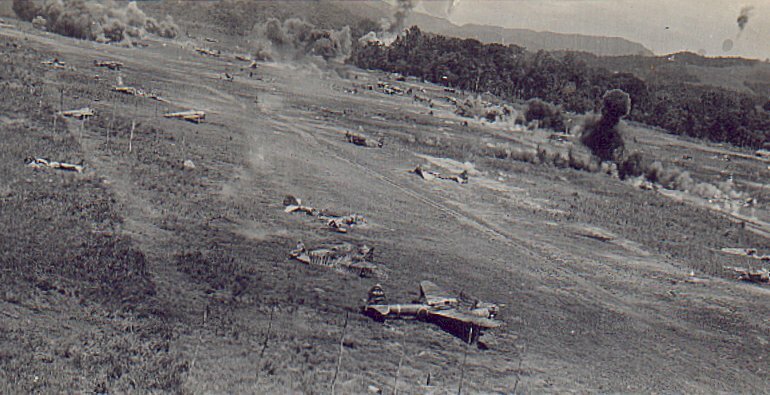 A bomb run over a strip at Hollandia, Dutch New Guinea. 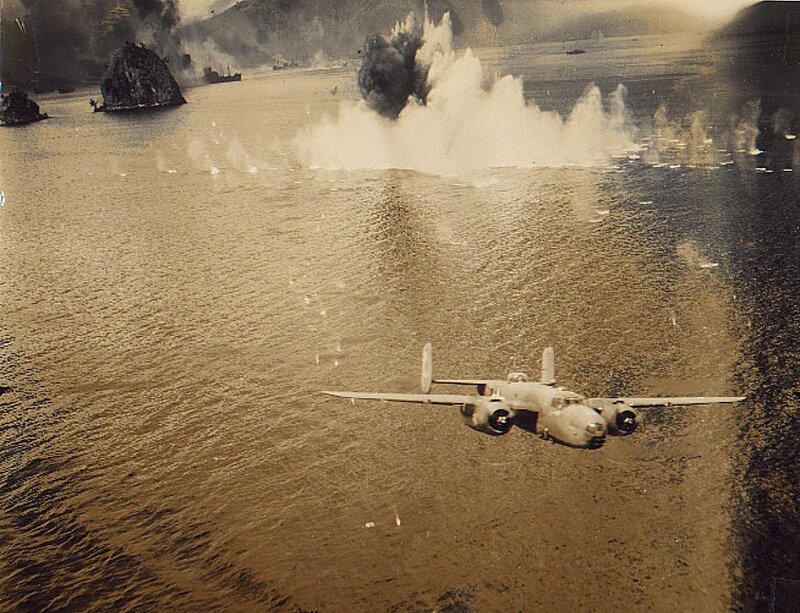 As you can see these planes were strictly low level attack planes. 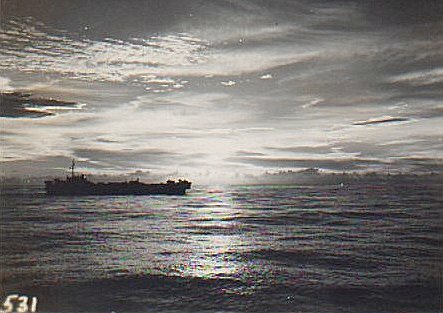 This photo was taken between Christmas and New Years 1944, on a convoy from Leyte to Mindoro Islands in the Phillipines. 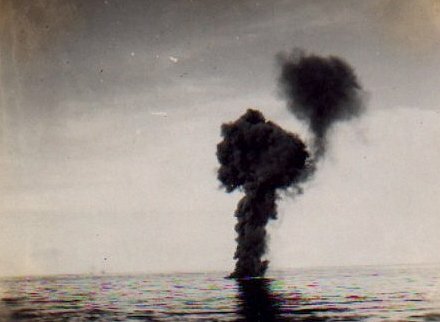 For two and a half days they were under constant attack by Kamikazes. 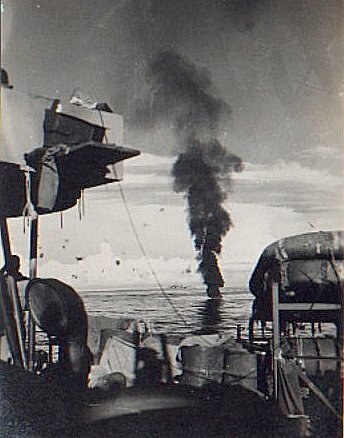 During the convoy from Leyte to Mindoro Islands in the Phillipines, the navy gunners, bless their navy souls, shot 25 kamikaze planes out of the sky. These three hit the water close enough for Jack Heyn to photograph them. But they did succeed in sinking eight ships out of the convoy. 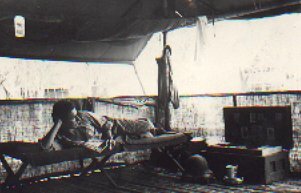 The convoy made landfall about midmorning New Year's Eve and had their equipment to the campsite by nitefall, and prepared to spend the nite under a shelter - half on the ground. Jack reckons it was one of the best New Year Eve's 1500 guys ever spent. They were just damn happy to be alive. 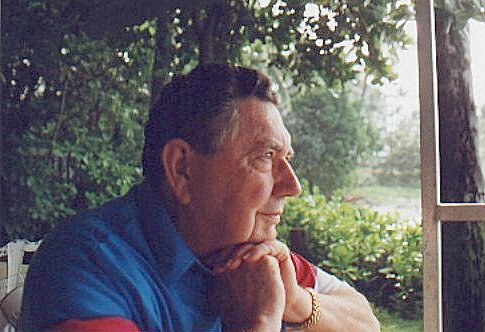 12 days later Jack Heyn got his orders for rotation back to the good old U.S. of A.
Jack Heyn on a vacation on the Big Island of Hawaii. 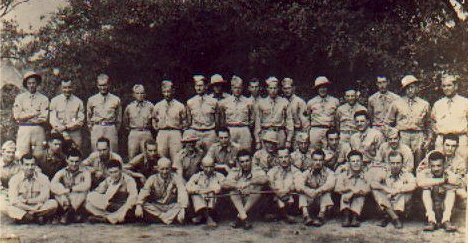 Jack Heyn, as a young man, holding his "weapon of choice" in WW II. 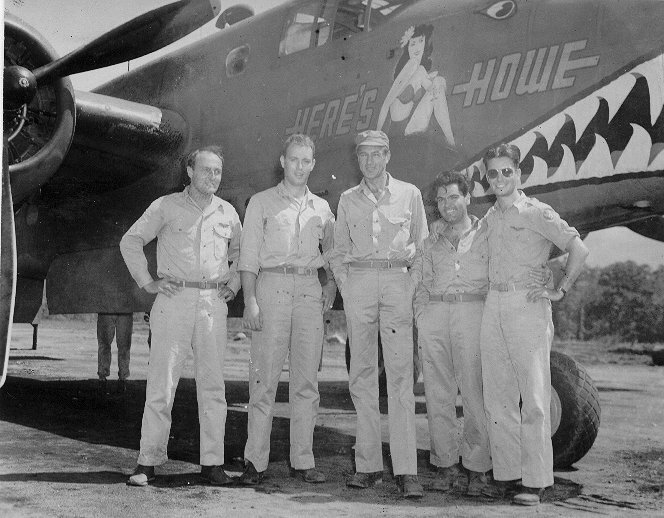 Gary Cooper and a group of 90th Squadron pilots standing in front of "Here's Howe" at Doba Dura in 1943. 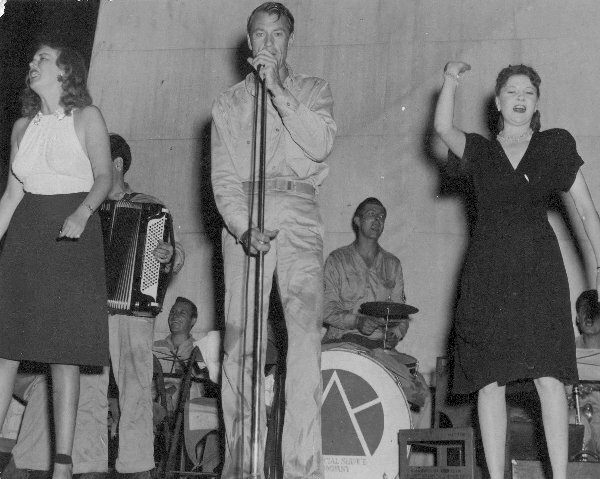 George Howard is at the far right wearing the sunglasses. 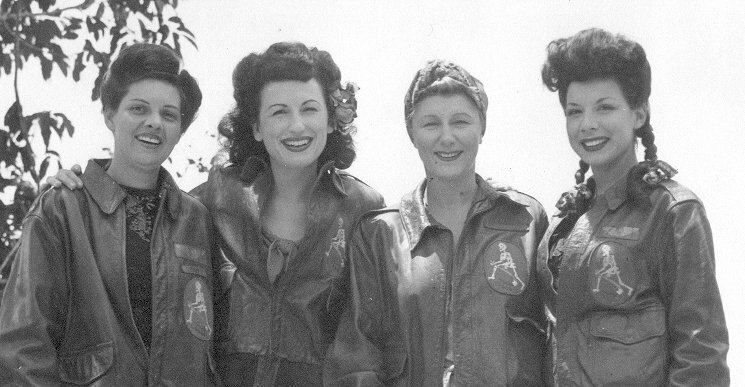 Helen McClure (contralto), Shirley Cornell (violinist), Judith Anderson (actress), Ann Triola (accordionist). 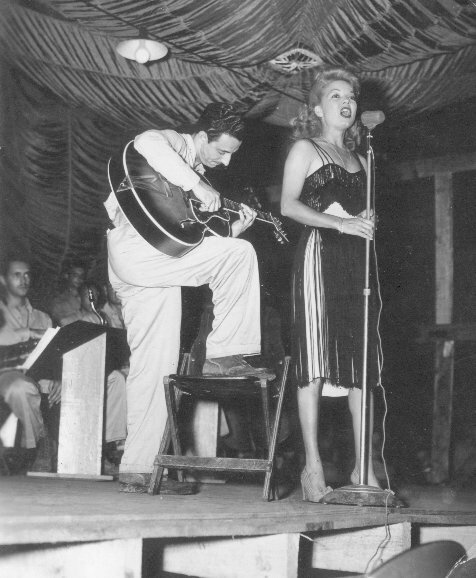 Absent was pianist, PFC Paul Parmalee. 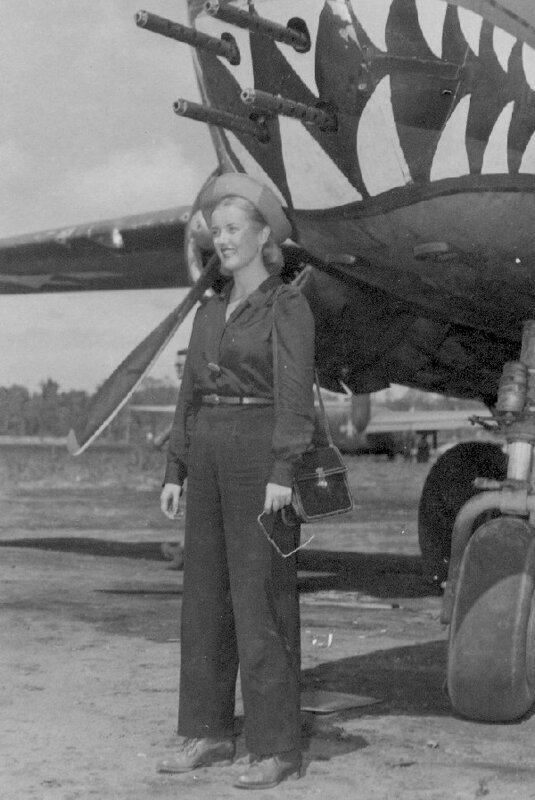 I'd like to thank my good mate Jack Heyn for making available his wonderful collection of WW2 photographs. I'd like to thank Tom Sharp for providing the names of all the ladies in the last two photographs above. 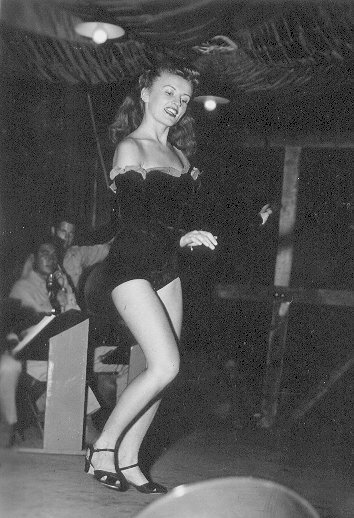 Shirley Cornell, who was still teaching violin in Jan 2004, provided the names to Tom Sharp. 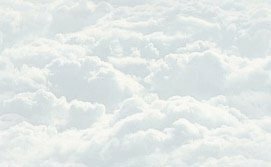 I'd also like to thank Dave Owens for his assistance with this web page. Dave is the son of Melvin E. Owens, Bombardier of the B-25 Mitchell "Mortimer".